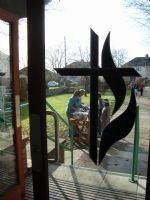 Following the move of our Sunday Worship to the Gryphon School in 2006, we have pursued a vision to release the church building back to the community to enable it to become a resource for working in partnership with other local agencies. The building was refurbished in 2009 to provide better facilities, including a new kitchen, disabled facilities and more amenities. We currently run three groups serving the community across the ages as well as operating a Foodbank for those in need. Why not select the options on the right hand side to find out more.